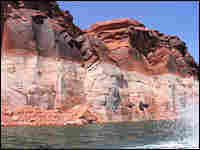 Lake's Low Water Level Exposes Prized Canyons Years of drought have drastically lowered the level of water in Lake Powell. That worries Western cities downstream that use the water, but it also presents an upside: Some of Glen Canyon's natural treasures were exposed for the first time in decades. This waterfall in Glen Canyon is a mere underwater spring when Lake Powell's water levels are higher. 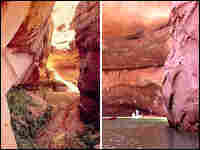 Current water levels in Lake Powell lie far below the "bathtub ring" high-water mark. 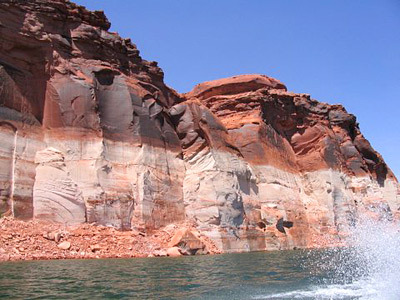 Years of drought have drastically lowered the level of water in Lake Powell. That worries Western cities downstream that use the water, but it presents an upside: Some of Glen Canyon's natural treasures are now exposed, for the first time in decades. Even as a wet winter -- and an ongoing thaw -- means that the lake is rising, nature enthusiasts have rushed to visit Glen Canyon to see a special place before it is flooded again. Newly exposed geological features include a waterfall and winding canyons in the sandstone. Most of it rests far below the high-water mark in the stone, caused by mineral deposits. Lake Powell, on the Colorado River, is expected to rise some 50 feet by the end of summer. When that happens, the waterfall -- and some of the magic of a "cathedral in the desert" -- will once again disappear beneath the surface.